My family toured southwest Manitoba over the Dominion Canada Day weekend in 2018. We stayed in Boissevain and visited the International Peace Gardens, then visited "small town Manitoba". It was a nice, low-key weekend and I really enjoyed the gardens, and especially revisiting many grain elevators that I had last seen on my two-day elevator tour in 2014. 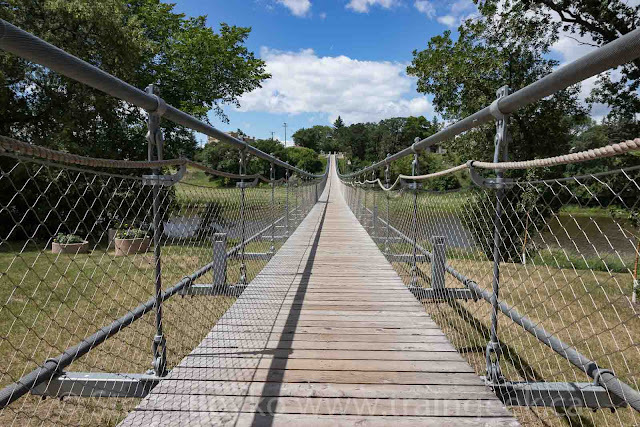 One town we visited was Souris, Manitoba. This is a lovely town that has a great downtown full of interesting shops, and it also hosts the Souris Railway Museum. 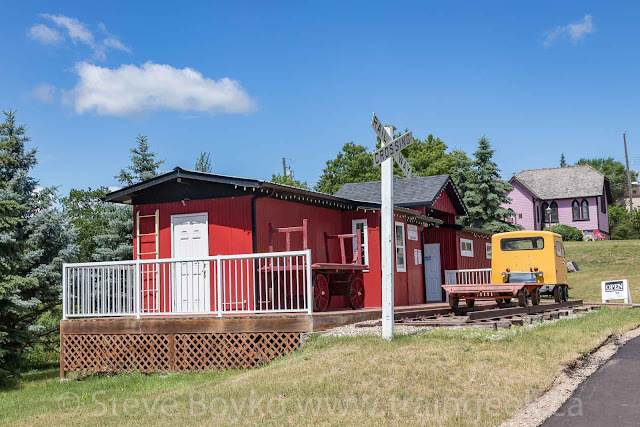 The museum is in a building built to look like a bay window caboose. 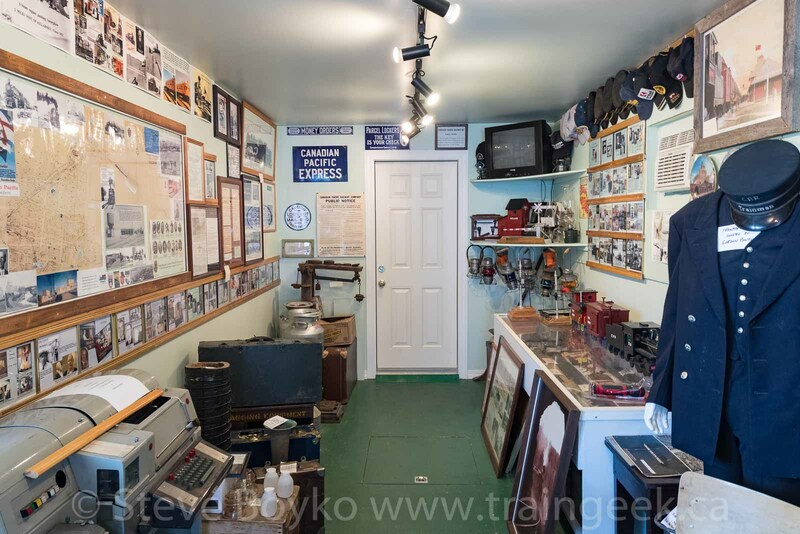 The interior is filled with many railway artefacts from the area, from Canada and beyond. There is a lot to see in a small space, and I spent a good half hour in the building, looking at the displays and talking with the two enthusiastic ex-CP volunteers there. One end of the museum contains a diesel locomotive simulator, a device they are quite proud of. It is really only available "by chance", as not everyone is trained in how to use it. The two volunteers there couldn't operate it but did show it to me. This is a purpose-built simulator, not a control console taken from a real locomotive. It's pretty high tech and the volunteer didn't want to mess with it. He said it was quite a good simulation. The museum is well worth visiting if you are in the area. Visit their web site for more information! 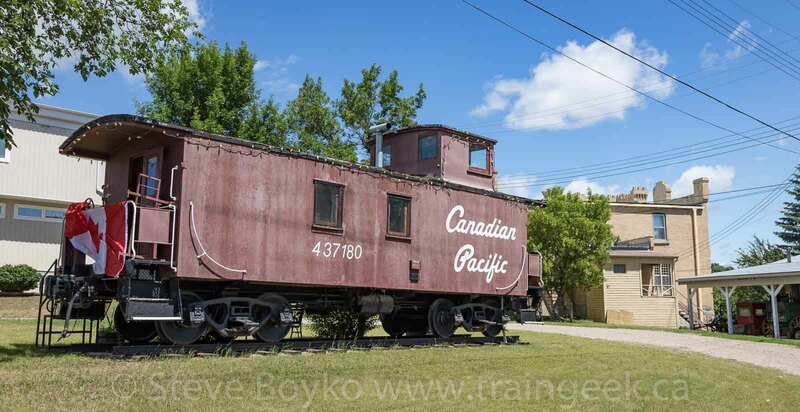 While you're in the area, see caboose CP 437180 just up the road at the Hillcrest Museum. Don't forget the famous swinging bridge - just on the other side of the Hillcrest Museum. We went to get some ice cream after touring Souris. As we were walking to our van, I heard a distant horn. 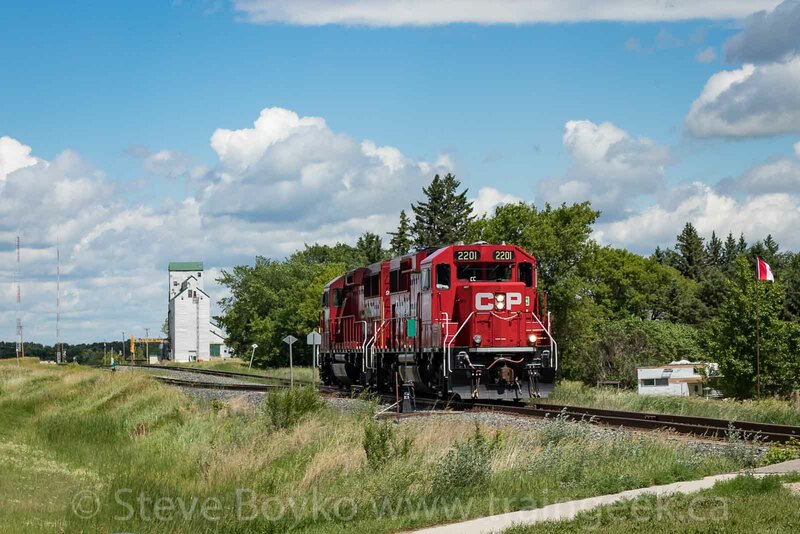 I hustled the family into the van and headed trackside, to find CP 2201 and 2212 running light through the town. A lucky catch! 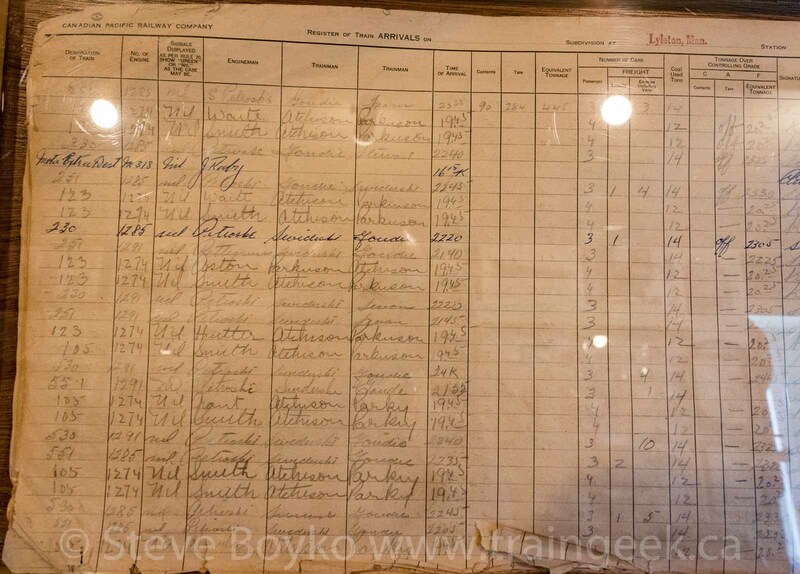 One artifact I was particularly interested in was this train register book from Lyleton, Manitoba, containing entries from 1955 to 1964. The page shows trains 105, 123, 124, 230, 251, 530 and 551. 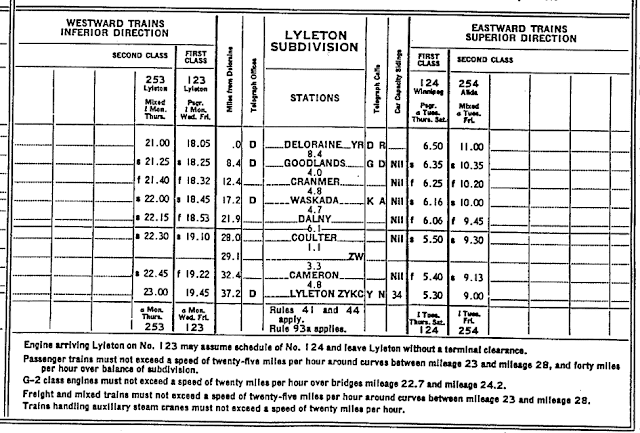 Some of those trains are interesting because the 1955/04/24 employee timetable only shows trains 123 and 124 (first class passenger trains) and mixed trains 253 and 254. Those train numbers are a bit of a mystery to me. 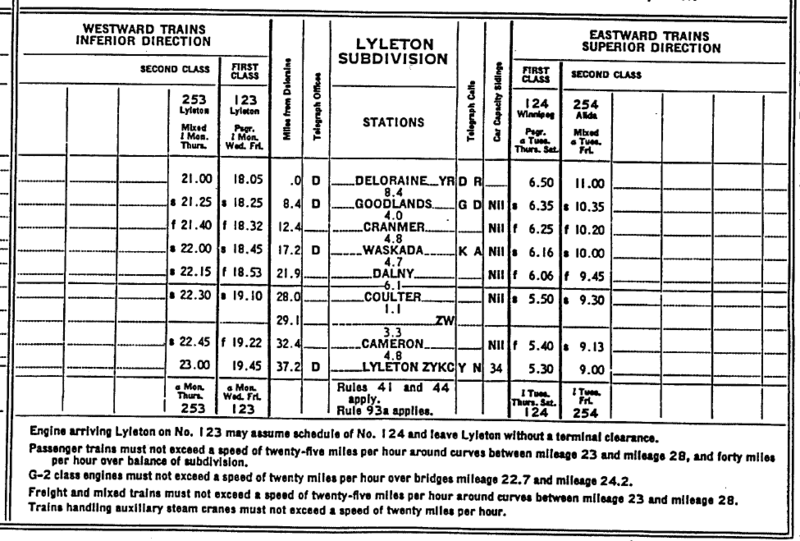 Lyleton must have been 2-6-0 "Mogul" territory at that time, as the locomotives listed on the register are CP 1274, CP 1285 and CP 1291. The trains weren't huge, as the CP Lyleton subdivision was a "dead end" subdivision starting on the CP Napinka subdivision in Deloraine and ending in Lyleton. The register shows 3 or 4 passenger cars and no more than 10 freight cars. I will stop for all small town museusms, lol they are always interesting and I find the volunteers are great sources of info and usually seem happy to have visitors! When you heard the train horn I pictured that commercial where the person is in a rush and yelling 'start the car!!". As I was mentioning, I found this site last night. 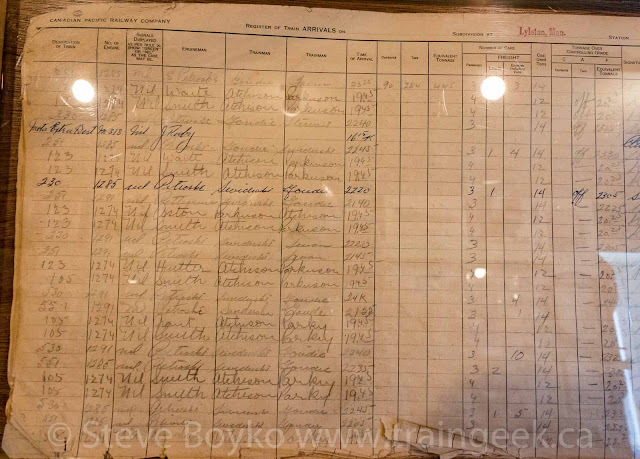 It's an extraordinary site with all kinds of historical information on North American railroads. There are images, timetables, historical documents, etc. Have fun visiting the site! Thanks, Patrice, I will check that site out! Jenn, I like the small town museums too! I had a great chat with the ladies at the Miami, MB museum about grain elevators.